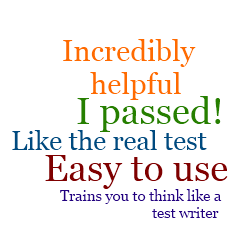 SWTP practice tests provide realistic exam practice that will help prepare you to pass the national ASWB Clinical Exam. Real-time, online practice is the best way to prepare for the LCSW/LICSW-level licensing exam. 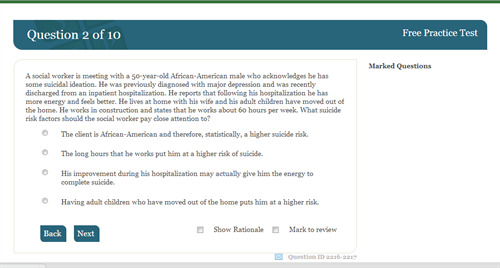 SWTP's 900+ exam questions include thorough rationales and suggested study links to help you understand both the content and process of identifying correct answers and passing the exam. Find more customer feedback on our testimonials page and blog. Use SWTP exams anywhere, anytime on desktop, laptop, tablet, or smartphone; no app necessary. If you haven't already tried SWTP on your cell, take a look! ASWB Exam. Five 170-question online practice exams. ASWB is the licensing exam for the entire U.S. and Canada. SWTP practice tests follow the ASWB clinical exam outline. Exams are four hours when timed.